Eighty degrees plus days are here! Whether you’re up early or running late, the challenge is to find a time that’s right for you and run with it. The life of a person with a typical nine to five job reduces opportunities for running to early morning, late evening or night and weekends. Practically speaking, who wants to engage in daytime running anyhow as it can easily get up in the hundreds and there would be no chance of keeping your cool then. Of course there’s the option of the gym and anytime running on the treadmill but there’s no fun in that. Summer calls for fresh breeze, swaying trees, the scent of a million nondescript things amidst the colorful voices of chatter and laughter and chirping and buzzing in the glow of sunrise or the aftermath of sunset. Schedules-smedules, it really dictates your pace. For my part, I’m stuck with evenings and night-time runs; not too bad really, but for the fact that I prefer early-morning runs. For one thing, it’s way cooler then as the sun hasn’t warmed up the day as yet. It’s also perfect quiet time. If you’re aesthetically inclined then you’ll appreciate this aspect of early-morning: the quiet and solitude, the just-there fresh dew upon the ground, plants and trees, the apparent newness of the day and the clean and sharp feel to the air. There’s nothing quite like waking up to greet a day that embraces and invites you to place your mark on it. 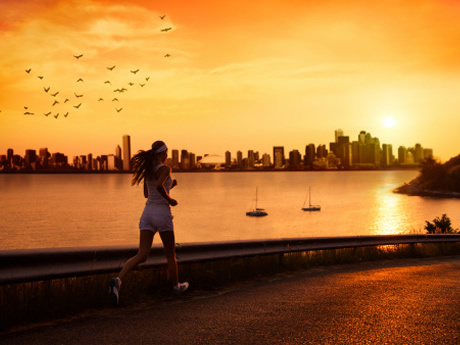 Other advantages to running at this time include: a minimal amount of traffic but a prevailing sense of safety, air pollution is at its lowest, it’s not necessary to run with fuel if you’re heading out for a short run and there’s no need for extra cover and/or sunblock. It’s an added bonus that an early- morning run opens up your appetite and leaves you feeling pumped and ready to sieze the day. If you’re a late-evening runner like myself chances are you run into night often enough and I’m talking big-moon-starry-night. For me, that’s the best part: the stillness the night carries inspite of the traffic and noise, the scatter of city lights against the darkness, the illusion of aloneness in the city parks even with other runners on the course, the opportunity to literally run the issues of the day away juxtaposed to doing an internal review of your day and planning for the next, it’s also easier to meet-up with a running group or a buddy since most people share a nine to five schedule and running after work is pretty popular, which provides you with motivation and accountability. Of course minimal wear and minimal or no sunblock is par for the course which leaves you with the only real disadvantage being wrapping up late and getting to bed then. But after a while of doing this, your body learns and it becomes part of your routine. A heads up on hydrating during these runs since it’s still pretty warm and often humid, you need to fuel up beforehand, during and after running. Another option for cool running in the summer is running in the rain. It’s actually a favorite of mine around this time. Lots of thunderstorms hanging around and it’s the fiercest feeling you get while running through one. Go figure..it’s you against the elements. We know who wins. Ideally if it would thunderstorm during the day, on weekends, those would make for some perfect runs but you really take it when you can get it. Afterall, our goal this Summer is simply to stay running and stay cool.